Q: Is the St. Joseph Lily named after the husband of Mary or Joseph of Arimathea? 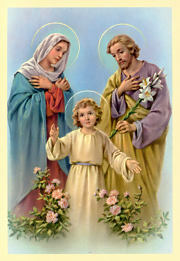 A: The lily is associated with St. Joseph, spouse of Mary, through an ancient legend that he was so chosen from among other men by the blossoming of his staff like a lily. Likewise, the biblical passage, "The just man shall blossom like the lily" is applied to St. Joseph in the liturgy of the Roman Catholic Church for his feastday, March 19. Thus, in religious art the lily is used as an emblem of St. Joseph, and similarly in religious flower symbolism the names "St. Joseph's Staff" and "St. Joseph's Lily" have been applied to a number of flowers - depending on the region. In the Roman Church, St. Joseph, the carpenter of Nazareth, is also venerated as the patron of all workmen, with feastday on May 1, and thus as the patron of all who work for the building of God's Kingdom on earth as it is in heaven. Thus, we have adopted him as the patron of Mary Gardening work.